Prefab walls are factory assembled based on your building plans, and enable your construction project to begin regardless of the weather. A prefab wall can be up to10’ (3 m) tall by 40’ (12.2 m) long. Once delivered to the construction site, the prefab walls are installed with a crane. Each prefab wall is ready to receive interior and exterior finishes as well as the floors and the roof, based on specifications. 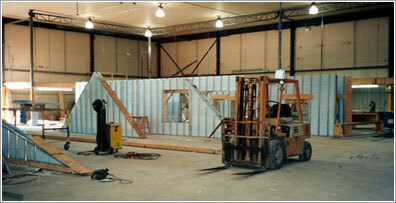 We can create your prefab walls with any of our ICF products. Building with Polycrete prefab walls is simple. This process is similar to building on the construction site except that the walls are assembled in our factory, without concern for the weather. Once Polycrete prefab walls arrive at your construction site, installing them is fast and your building structure will be up in no time. 1. DESIGN AND PLANNING. Based on your building plans, workshop plans are made with all necessary specifications and procedures for factory assembly and construction site installation. All activities are managed by a team of professionals to ensure an irreproachable quality. 2. WALL ASSEMBLY. Walls are assembled at the factory based on the workshop plans determined at the previous step. Our installations are optimized and well equipped for the assembly and storage of the prefab walls. This step is done by a professional team well supervised and trained. 3. CONSTRUCTION SITE PREPARATION. The excavation and the footing are two major aspects of this step. The construction site also needs to be accessible to the different transporters involved in the following steps. 4. DELIVERY. The prefab walls are delivered directly from the factory to the construction site according to a pre-determined delivery schedule. Flatbeds are usually used for prefab walls’ transport. 5. INSTALLATION. 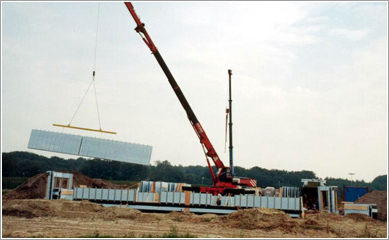 When the prefab walls arrive at your site, they are installed by a crane with a lifting beam, in the sequence and place specified by the installation specifications. Each prefab wall comes with transport hooks. Once in place, prefab walls are joined together and aligned via the Polycrete® scaffolding system. 6. FLOOR STRUCTURE AND ROOFING. The floor and roof installation step is the same as if the walls were installed at the construction site. The only difference is that most of the time the floor and roof anchors are already installed on the wall at the factory. 7. FINISH. Apply finishes or siding on prefab walls the same as on walls built on site. The only difference is that prefab walls can be prepared for the finish in the factory. For example, waterproofing membrane or furring can be installed at the factory.